Please click on the Puppy Page, for more info on available pups. Please read my Policy & Payment page for information on placing deposit, or Contact me with questions. Previous litters of Labradoodle Pups We have 1 adult available, Edison is retiring. The origin of the Labradoodle is a cross between a Labrador Retriever and a Standard Poodle. Labradoodle's have the intelligence of a Poodle and the faithfulness of the Labrador. 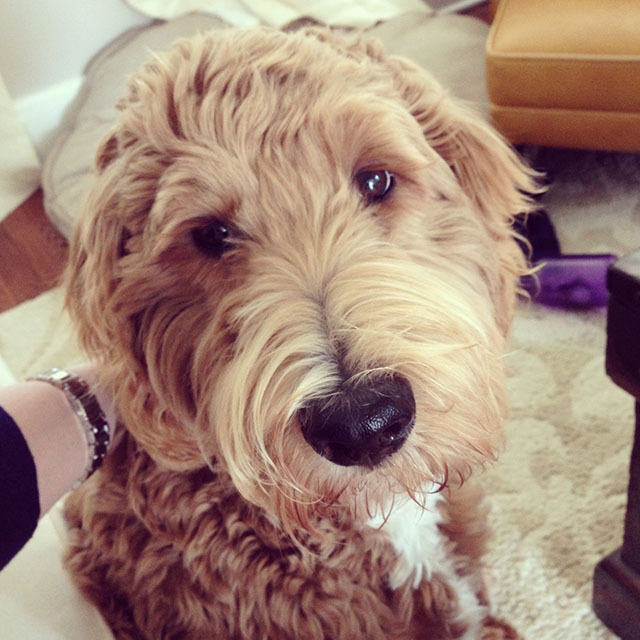 Labradoodle's have sound health with a hybrid vigor. They get the best traits of each breed. They have gentle, friendly and loving personalities. 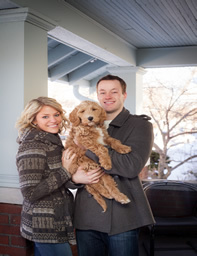 Labradoodle's are excellent loyal family companions and they long for human contact. Their unique traits of an intuitive nature, and the seeking of human eye contact should be easily noticed at a glance. Which is why Labradoodle's are usually easy to train. Their allergy friendly coats make them popular among people who have not been able to enjoy pets because of their allergies. Labradoodle's are Great pets for runners looking for a jogging partner!! Great family pets, friendly and loving. Great for the active family that wants to take their dog everywhere with the family. I believe personality type of each pup is very important in any breed and can vary within the same litter. The Labradoodle is very intelligent. You must remember they have a great start here with us, but it is up their new families to make them their perfect family pet. You can't just give your pup affection. Discipline and training with consistency makes the perfect angel. You and your entire household must be committed to your puppies needs before considering bringing a pup home. 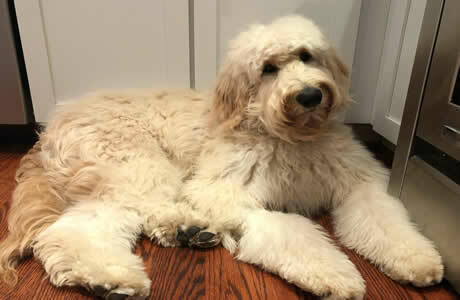 Labradoodle coats can vary from flat and straight easy to maintain coats that would be considered low shedding, to fluffy and curly, thicker coats that are completely non shedding. There are two totally different types of Labradoodle's, the Australian Labradoodle and the American Labradoodle. The Australian Labradoodle is considered a purebred dog. The American Labradoodle is a hybrid dog. There are a few different types of American Labradoodle's. F1 = 50% Labrador and 50% Poodle - This is Lab to poodle cross, this is first generation, resulting in healthier offspring! This is called Hybrid Vigor. Hair type can be smooth like a Lab, or Wavy/shaggy, they are non or low shedding. Pups coats within the same litter can vary . This is not the best cross for people with severe allergies. F1-B = 25% Labrador Retriever and 75% Poodle (F1 Labradoodle and Poodle cross) - This is Labradoodle bred back to Poodle. More Wavy Curly shaggy looking doodles. F1B is the MOST likely of any to be non shedding and Allergy friendly. F2 = F1 Labradoodle and F1 Labradoodle cross - this combination you get the same percentage of Lab Poodle mix as you would an F1 Labradoodle so they are more likely to shed. Not really a good reason to do this unless you are starting your own line of multi generation doodles. Multi-generation = F3 or higher generation, or F1B and F1B cross is the best way to start the Multi generation line. - This is what the Australian Labradoodle's are, except they are usually at lest the 5th or 6th cross, and Australians do have other breeds in them, they are NOT just Poodle and Lab. Not a hybrid breed. Coat types When it comes to a Labradoodle coat, the look of your dog will depend very much on the way you have them groomed. Many groomers tend to cut doodles just like they cut poodles. If you like the fluffy look ask your groomer to cut more like a teddy bear and less like a poodle. Curly/wooly coat - has the feel of the poodles coat with a looser curl, non shedding! Fleece coat -has a fluffy, shaggy appearance with a loose wave. Fleece coats have a distinct soft fleecy 'feel' like no other dog coat. This coat is what the Labradoodle is famous for. non shedding! Jasper has a fleecy fluffy coat! Straight/Wispy coat - looks more like a Labrador's coat from a distance. When you get a closer look you will notice their hair is longer and with a little wave. This coat type will probably shed a little, however it is low maintenance. The easiest coat type to care for! This is a curly/woolly coat, non shedding! Lacey pup 1 year old. This is a wavy fleece thick fluffy shaggy coat, non shedding! Ginger pup 1.5 years old. Her hair is straighter but thick! This is what Zeus looked liked at 4 weeks old. Standard: Weight - Female - 40-60 pounds Male - 50-80 pounds Medium to large Breed dog. If you are interested in a Labradoodle pup, please visit our Payment & Policies page for more info, and contact me. 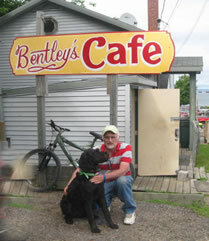 Bentley boy at his restaurant, summer 2009. Bently is a F1 Labradoodle. 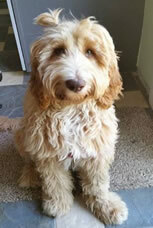 Also check on our Boarding/Just visiting page for more Labradoodle pictures.